That tends to happened to us too when we are broken. Our brokenness spreads into all aspects of our lives, right? Our sleep suffers, we don’t want to deal with friends, and everything hurts. 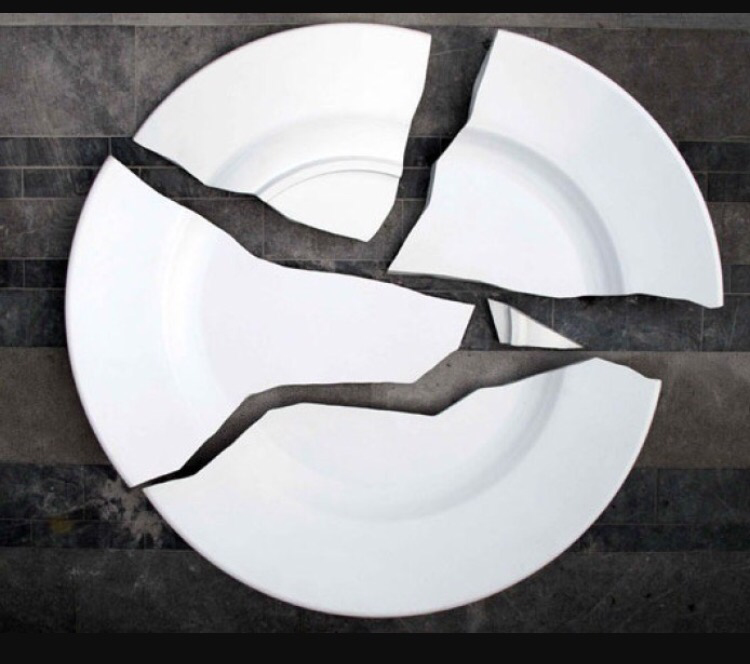 We can try to clean up the brokenness, but just like a broken glass, or plate, the shards are not that easy to grasp. We tend to miss a piece here or there because we are focused on the bigger pieces of the brokenness that we miss the other pieces like depression. Depression is a real thing, a real part of brokenness that we often refuse to look at because, well let’s be honest, who wants to admit that they are depressed. **Disclaimer: I am in no way saying that if you are depressed that you are broken** — I have been there. It is a struggle, sometimes to get out of bed and face a new day. However, seeking medical help (be it therapy or just talking to someone) is important. You are not alone and you are loved. I love you and Christ loves you. I know that sometimes it feels as if you are all alone and no one hears you, and this sliver of pain, of brokenness, will never go away. Just hold on and keep pressing. He is here. He hears us. That’s the wonderful thing about being broken. Christ will come and fix them, fix us! He is near to us and he hears our cries. He tells us to come to Him for rest and sometimes we just need to rest. There is nothing wrong with seeking help and trusting in God to deliver you from the brokenness that you feel in your life. You can do both and still be absolutely ok and still be a Christian (you don’t lose your Christian-ness [is that a word?]) for seeking help). I promise. Putting the plate or glass back together again is a tedious task, let’s be honest (it really is). We usually end up with fewer pieces that what we started with and then the tiny pieces are missing, and we end up just throwing the item away and feeling like we wasted time trying to fix it in the first place. With that in mind and still being completely honest, that is what it feels like when we try to put ourselves back together again. There are little holes from where the slivers went missing, or giant gaps because we placed a piece upside down or in the wrong place, or we completely missed a piece somewhere that is now lost forever. When this happens we tend to beat ourselves up and sink into depression or even worse suicidal thoughts. The great part about all this is that God can put us back together again and we’ll be better than we previously were. He can fill the broken holes with a newness that will make you so much better than you were before. The biggest question is will you let Him? It’s so true that brokenness spreads into other parts of our life – but I’m so encouraged by your point that God can make us whole again – and even better because He’s the author of our lives. And your last question is poignant — will we let Him put us back together? Even if it’s painful and our ego gets crushed… we will do even better if we allow our loving Father to fit all the parts together into something new. Yes. Thank you so much for taking the time to read Fixing Brokenness. I greatly appreciate it. You are absolutely correct that if we allow Him to put us back together again, even when it hurts, we’d be better. Like a complete puzzle. I pray that this piece touched you in some way. Be blessed. Thank you for taking the time to read Fixing Brokenness. I pray that it touched you in some way. Stay blessed. Yes!! When we feel “brokenness,” it does for sure spread into all aspects of our lives. Thank God he comes and puts all of our broken pieces back together. Great post!! Thank you for taking the time to read Fixing Brokenness. Yes! That’s the wonderful thing about God. He is the best at fixing broken things. I pray that this piece has touched you in some way. Stay blessed. Indeed we need to let God take control heal us from brokenness. Yes. He is the ultimate healer and can do a new and wonderful thing in our lives. Thank you for taking the time to read Fixing Brokenness. I pray that it touched you in some way. Be blessed. Beautiful. It reminds me of the song Pieces by Bethel. Thank you for taking the time to read Fixing Brokenness. I will have to listen to the song because now I am intrigued 😊. I pray that this piece touched you in some way. Stay blessed. Absolutely love this. I’ve felt broken before and it was painful, but God was there to heal and protect me. Thanks for sharing! God is such a wonderful healer. I love how he constantly fixes us. I thank you for reading Fixing Brokenness and I pray that you received something from this piece. Stay blessed.